If Charlie Baker wants to find inexpensive ways to improve the T, he might consider one fact: In 1954 — two years before he was born — the 34 bus ran from Forest Hills, down Washington Street past Roslindale, and onward to the Dedham line. In 2015, it still does. The map of where the T runs its buses would appear to be etched in stone: In some cases, today’s MBTA buses are still running along the same routes as the trolleys that preceded them. Yet the city surrounding those buses is unrecognizable, with huge population shifts and the emergence of whole new employment centers. Provide better routes through and into bus hubs and major stations like Dudley. Go ahead, zoom in and out, follow it along. What will you see? There are no parallel streets to Washington Street in Roslindale! In fact, the 34, along with a whole host of other buses along Washington Street, follows a straight line, the only possible one. Actually, as far as route geometry goes, it's nearly ideal. So if I may quote Jarrett Walker, the 34 is already mostly as good as it gets, geometrically-speaking: "An efficient transit line -- and hence one that will support good service -- connects multiple points but is also reasonably straight so that it's perceived as a direct route between any two points on the line." The 34 itself is nearly perfectly a straight line, and it serves a street that is nearly perfectly a straight line. The companion route 34E continues that straight line, except to diverge at one point for the Dedham Mall. And at the point where it diverges to serve that suburban mall, it turns out that it's really difficult politically to do anything about that. But the problem there is that a suburban mall like that is nearly impossible to serve well with transit. The error lies with the land use, not with the bus planning, which is trying to make the best out of a mess. I'd support a re-routing that gets the 34E out of the Dedham Mall if that were possible. But that goes to my point above: a targeted re-routing. There's simply no way to take the 34/34E off of Washington Street itself because there are no alternatives. And a whole century's worth of development has taken place with the idea of there being frequent service along Washington Street. That's nothing to scoff at. That's simply how Boston has developed. While the T often changes the frequency of buses, treating the routes themselves as sacrosanct is a recipe for inefficiency. To make sure the T is maximizing the value of its buses and drivers, the agency should imagine how the map would look if it were building a Boston bus network from scratch, based on today’s population and economy — not that of 1954 or 1912. First of all, the MBTA needs to do a bus service planning process update. It hasn't had the funding to do so in a few years. Getting that done is a good idea! But it won't involve re-routing buses, so apparently, that's not good enough for the Globe. Instead they'd rather have the T spend money on a study that can only come to one conclusion: that there's no alternative to Washington Street for the 34/34E. That's wasteful. I promised earlier that I would describe why Boston's street network makes the bus re-routing style of optimization that was accomplished in other cities much harder here. Not always impossible, but of much more questionable value, especially for the really heavy workhorse routes. You could probably find some changes in a meandering route like the 51, but that's small potatoes. No, the reason that Boston's bus network largely follows the streetcar routings of a century ago has to do with the way Boston developed: as an amalgamated set of Streetcar Suburbs. This section of Blue Hill Ave was once served by the "29" streetcar but is now served primarily by the key bus route 28. If I may summarize the story of "Streetcar Suburbs" very quickly and very broadly: These suburbs were laid out by developers interested in maximizing their investment by providing streetcar access to as many homes as possible. The streets were often privately built and "donated" to the town/city later. What mainly characterizes these streets is the long blocks that feed primarily into a single, wide avenue where the streetcar ran, moderated by hills and valleys. The result was a kind of "hierarchy" of streets that would later be taken to extremes by auto-centric suburban planning, but at this point in history was merely a result of trying to maximize investment in the streetcar adjacent plots of land. What you should notice right away, again, is that: there are no efficient alternative routings. This is not a freak accident. It's a very, very common pattern throughout Boston's inner streetcar suburbs. I actually brought this up at the YPT event with Jeff Speck, if anyone happened to be there, and it's an endlessly frustrating quirk of a large number of Boston's neighborhoods that impacts us in many ways other than bus routings. Besides Blue Hill Ave and Seaver Street, there's Columbus Ave and Tremont Street, Warren Street, Washington Street (Roxbury, Dorchester, South End, Roslindale, and Brighton editions! ), Dorchester Ave, Columbia Road, Huntington Ave and South Huntington/Centre/South, Massachusetts Ave, Beacon Street, and Commonwealth Ave. I'm sure you could name more. These are all streets that were built in neighborhoods that have all traffic (foot and vehicular) funneled onto them. Intentionally. And there are not any easy alternatives, especially when dealing with heavy buses that shouldn't be making awkward turns onto small side streets. The Boston Elevated Railway company understood this. That's why their version of Boston's streetcar network was based around the idea of hub-and-spoke: feeding the surface lines into big hubs around rapid transit stations. Now, Jarrett Walker's great idea in many other cities is to take a bunch of duplicative, one-seat-ride-style routes, and to reform them into a more powerful grid using connections. 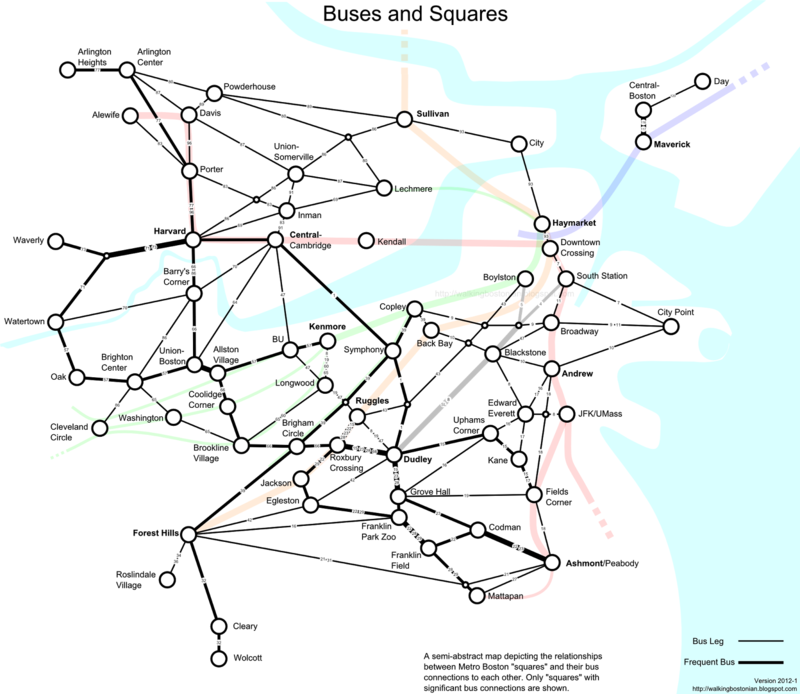 But Boston's surface line system is already based around the concept of using connections: to the rapid transit network, and also to each other. Yes, it's not a grid in the sense of San Francisco, but Boston doesn't have a grid of streets. It doesn't even have good connectivity of streets, outside of the core. That's why the rapid transit lines have been so important and are so heavily used in proportion to city size: because they cut through the web. The surface line network is a web of routes woven onto a set of rapid transit points. The buses largely follow the streetcar network because the streetcars built the streets in the first place. And those same streetcars laid out the development patterns in the 19th century that we still live with today. I live in a building that was erected in 1895. Most people in Boston live in buildings that are over 70 years old. That's no accident. When zoning was legalized and authorized in the 1950s, it basically squelched small, incremental redevelopment. That's one reason why we still have single-story retail. It's also one reason why most of us still live in the same places (often the same buildings) and follow the same patterns that people of a hundred years ago did. The other major reason is path-dependency: it's hard to change things that thousands of people depend upon. Such changes often came about because of massive mega-projects, and often for the worst reasons. I just spent a lot of time explaining why it's hard to change bus routes in Boston. But now I will offer some examples of where change does happen. First of all, I have to be thankful for the existence of the Transit History Roster of the MBTA. Now, let's take a look at the kind of changes that we see. The 1 actually provides a good example straight away: "This route was created in September 1962 by merging Routes 76 Harvard-Mass. Station and 47 Mass. Station-Dudley." Not really a re-route, just a through-routing that was probably happening anyway for equipment management reasons. Or maybe because the trolley barn on Newbury was being closed. Let's look at a route created in the MBTA era: 47 "This route was initiated as a brand-new Monday-Friday only cross-town service in April 1972. The route traveled in new territory between Kenmore Sq. and Dudley via Brookline Ave, Longwood Ave, Huntington Ave, Ruggles St. and Shawmut Ave." Obviously there have been further changes to the route since then, and if you go to page 190, you can read the gory details. The 47 was created in 1972 to serve one of the "new economy" nodes that the Globe crows about: Longwood Medical Area. And it is well-used, in my experience, being packed to the brim. It needs higher frequency. It needs bus lanes. It does have a few jogs that I find to be obnoxious: The U-shape it makes inside of Longwood; the loop around Ruggles; the in-and-out it does to serve Dudley. But you cannot eliminate those jogs without annoying key constituencies. Longwood, Ruggles, and Dudley are important nodes. It's really not clear how the 47 could be better routed while still serving those nodes. I bet some clever street reconfiguration could make it a lot less painful, however. The problem that Longwood has always had, and the 47 is only a band-aide, is that it was built up in a bit of a transit dead-spot. The "D" and "E" branches of the Green Line tangentially glance off of it. Those stations are heavily used by LMA workers, despite the walk, which is great. But barring the sudden appearance of $10 billion from the sky, to dig a tunnel, the LMA will never have the same kind of powerful, frequent radial transit that the Back Bay enjoys, for example. There's some hope for the Urban Ring to descend upon us and provide a real upgrade to the 47, but I'm skeptical about it ever happening. That's another article, for another time, though. A major change happened when the Southwest Corridor was opened and the Orange Line was moved from Washington Street. Many buses had to be rearranged slightly to connect with Ruggles Station instead of or as well as Dudley. In fact, key bus route 28 was created out of pieces of two former streetcar routes at this time, and extended to serve Ruggles. The resulting route is approximately as direct a path as you can get between Mattapan, Dudley, and Ruggles, and it also happens to pick up right in front of Roxbury Community College. It's hard to imagine what other routing could accomplish so much. It's already one of the top buses in the system, by ridership. What it needs is dedicated bus lanes, signal priority, and all-door boarding. Yes, it's possible that the 28X package that was offered up a few years ago could have achieved some of that. I wasn't involved so I don't know first-hand what went wrong. But I've heard second-hand that the reason it failed was that it was shoved suddenly and heavy-handedly, from the top-down, on a riding community that was wary of changes arriving in such a manner. Much like the Melnea Cass BRT plan from two years ago that was roundly rejected. What this teaches us is that bus routes are political topics and it's important not to approach them from a purely technocratic viewpoint, as much as such technical ideas are useful for steering the conversation. A commission to "re-examine bus routes from scratch" would be stirring up a hornet's nest for very little gain. Maybe some twisty routes like the 51 could be rejiggered. But we're not going to be cutting new streets through existing neighborhoods anytime soon, I hope. A committee to examine the routing of the 34 bus on Washington Street (Roslindale) is going to come back with same result every time: keep it on Washington Street, duh. The 77 should stay on Mass Ave (and no, the Red Line extension to Alewife did not eliminate the need for the 77 to Harvard!). Blue Hill Ave south of Grove Hall needs to be served with lots of buses. That's not going to change. What might change the bus network is the opening of the most recent rapid transit line to be built: the Green Line Extension. But how that will change things remains to be seen. Instead of wasting time debating the routing of the 34, the 28 or the 77, we should be focusing our resources on getting bus lanes, signal priority, full accessibility, all-door boarding, more efficient routes through stations, clearer route information, more buses, more service, and the like. We should be clear about the goals of various bus routes, whether it be "Coverage" or "Ridership". Some of this could happen through the supposedly 'biennial' service planning process, if it were funded again. And some of it requires coordination with the city of Boston and the various other municipalities in the area. Perhaps the new "future focused transportation improvements" policies from the city are an indication of changes to come. The MBTA has been slowly working to make the system more grid-like and add more crosstown links to new nodes. The current 1, 66, 47, and 86 as well as the CT routes are all the results of the MBTA adjusting the network, and are relatively recent changes, at least compared to routes that have stayed the same since the streetcar era. There are still changes that could be made, but they're partly needed due to relatively recent developments that the MBTA hasn't had time to adjust to yet: more access to Kendall Square, for example, or a Somerville crosstown route to Assembly Square, or the as-yet-undetermined reworking of the bus network for the GLX, which isn't even really under construction yet. The improvement that we really need is dedicated lanes for surface transit (whether light rail or true BRT). This is a really neat post! That said, I'm curious how much of the focus of Boston's street network on arterials with no alternatives is due streetcar companies and how much is due to the deeper history of the area. After all, my understanding is that Los Angeles was also largely developed as streetcar suburbs, with developers building neighborhoods around their rail lines. However, Los Angeles did manage to end up with a pretty good grid pattern of streets before freeways replaced streetcars. My assumption had always been that Boston's web-like street grid was due to the area's history as a collection of farming villages with communal field areas in between them, due to New England's Puritan tendency to have farmers live in villages near the church and commute to their fields, rather than the other way around as was common in most of the US. I get the impression that many of the squares, with their formerly-Puritan Unitarian or United Church of Christ churches, were at one point colonial villages, and that the main arterials tend to have a history as inter-city roads (rather than streets) that reached through the farm fields to connect them. Sometimes constrained by geography: for example, Washington St from Dudley to the South End follows the old Boston Neck isthmus, which I believe is why so many roads (and bus lines) come together at Dudley, and why it was an important bus-to-T transfer stop on the old Washington Street Elevated before it was demolished. You're probably right about how many of the original streets developed as intercity roads initially, like the Roxbury Highway. Once a streetcar was running, it made sense to have real estate developers build a streetcar-feeding pattern of side-streets and parcels. Most US cities developed after 1800 (and some before) imposed a grid pattern on their layout, regardless of pre-existing development or geography. Especially out West. Such grids are conducive to refactoring of the surface transit network not only because they are grids, but because they don't hardcode the existing patterns of travel and development. It makes sense to talk about shifting patterns of development in such a context, and about adjusting bus networks to more efficiently serve them. First, kudos on your ability (and willingness) to think more deeply on urban transit concepts than I've seen elsewhere in Boston. As to the street patterns the city suffers under, it is not as bad as initially thought, given the flip side of the coin, and the ability to think a bit outside of the proverbial box. That flip side is the good fortune Boston enjoys with the several rail corridors it has inherited from another era; at least those it has not relinquished. I'm not a fan of bus use in urban areas where demand can support tram service; whereas it is quite suitable (actually desirable) for highway travel as a commuter service for many of the instances where rail is being used or proposed (your opposition to SCR is noted, and applauded). Buses in cities on surface streets are unpleasant modes of travel, and Boston could (if it wanted) once again have an affordable tram network interlaced with rapid transit stations. But, very important to grasp here, is that I'm NOT referring to the typical image Americans have of light rail; for instance, the GLX is a terrible implementation, actually a terrible hybrid of heavy-light rail, missing on all counts for providing good transit benefits at justified costs.